Your Swimming Brain | Mediterra - Swim & Run Better Than Ever! What draws you to the practice of Total Immersion? Is it smooth swimming? Is it for health and fitness? A lifelong goal? What about as a method to train and sharpen your brain? Does it meet all those aims? The brain physically and cognitively is absolutely fascinating. Some years ago, in college one of my top five favorite classes was neurology and the subject still draws my eager attention. I came across an article from BBC News and wanted to share it with you. 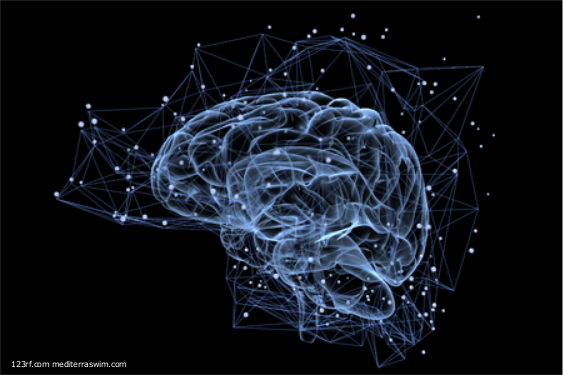 “What The Brain’s Wiring Looks Like” written by Fergus Walsh shares how scientists at Cardiff University have developed a scan that provides a 3D video perspective of the inner circuits threading through our cerebrum. Their graphic representation is able to show the direction, concentration, and flow of neurons firing in the brain. That’s like having a Yandex Traffic Jam app for the brain! Wouldn’t it be wonderful if we could map our brain while we were practicing our swimming? Even though the brain controls everything in our bodies and our technology for studying it is improving at a fast rate, and it seems like we’ve learned so much already, so much still remains a mystery. This is what makes it so exciting. We are able to use our current understanding to do so much more in repairing and training the brain, while we remain curious and desperate to learn more. This applies to our coaching in the water as well! For me, as a swim coach working and training with Coach Mat, I have come to realize the brain is the greatest and most challenging body part we are training in our athletic practice. In our group workshops and private training sessions we use demonstrations, rehearsals, drills and carefully chosen focal points to intentionally build the neural pathways necessary for smooth, seamless swimming. As you know it doesn’t happen by accident! Each person has a unique starting point – the coach studies the swimmer to see what neural pathways they are able to use right now, and then adapts and customizes the training process to improve that neural network to bring it closer to smooth and seamless swimming. Sometimes I find myself dreaming of possible tools we could use to help swimmers make the connections they need. Wouldn’t it be powerful if we had projected bullseyes for our target zones, a meter that detected balance on the lead arm, buzzers when the head tilts up or neck tenses, etc.? I’ve gone so far as to wonder about a suspended harness for controlled movement simulations in order to identify how something is supposed to feel. The truth is, however, nothing beats the hard work of training the mind to pay attention to the signals coming from the body. It takes time and effort to build skills with the mindful awareness of both the body and environment, but this is the most effective way. Mindfulness and skillfulness go hand-in-hand to create a meaningful, sustainable skill and an enriching practice. The process of building those new neural connections, the muscle memory and the proprioception can have its peaks and plateaus. When we stick with the practice persistently though, we gain smooth, seemingly effortless swimming, overall fitness and a healthier, thriving brain as a result. I thought it might be useful to revisit some of our previous blog posts on how the brain plays a role in our TI technique and practice. Below I have compiled a few that you might find interesting and a few additional resources to explore the topic further. Take a look and feel free to share your thoughts and observations. Many people seem to care about what will happen to their physical quality of life as they get older. But do you wonder what will happen to your mental quality of life as you get older? In a neurologically-oriented training program a brand new swimmer will experience both kinds of exhaustion. He is both building a new muscle and a better fuel supply network, and he is causing his neurological system to control movement in ways it never has before – these are both exhausting because his limits are easily reached. The kind of practice that will actually improve your skill – to improve the precision of your movements and train them to stay precise in high intensity, longer distance, and under more difficult conditions – this requires your full attention. Give your brain time to solve it and improve control – it takes time for the brain to build to support structure for those new signals. Your objective is to touch success and then repeat it, and then repeat it successfully with more frequency to give the brain time to build the circuits to support this repetitive movement. You’ll find that in some of the blogs we have already shared some resources and references. Below I have listed a few that you might find interesting in reference to our topic. Enjoy. May your practice and development be smooth and rewarding.